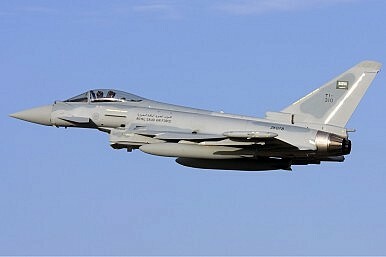 Can Eurofighter Beat Its Competition on the Asian Market? The Typhoon is a good fighter but faces keen competition in Asian markets. The Diplomat has recently been writing a series on the prospects of combat aircraft sales in the Pacific states. I’ve earlier covered French Dassault’s Rafale, U.S. Boeing’s F/A-18 Super Hornet, and Sweden’s Saab’s Gripen. Robert Farley and myself have also written about the development and prospects for fifth-generation stealth aircraft in the region. The Eurofighter Typhoon is another platform that is attempting to gain ground in Asia. Eurofighter is a consortium made up of Italian Alenia Aermacchi, European Airbus, and Britain’s BAE Systems, making it a truly European fighter. In service since 2003, the Tyhoon is the main multirole fighter of the U.K., Germany, Italy, Austria, and Spain, and has been exported to Oman and Saudi Arabia. The aircraft has proven its combat worthiness, at least in a ground-attack capacity. In 2011, British Typhoons flew several ground attack sorties on Muammar Gaddafi’s forces during Operation Ellamy, reportedly destroying over 100 Libyan tanks and military vehicles. Italian Typhoons also participated in the operation, albeit in an aerial combat patrol capacity. So far, the Typhoon has yet to find any buyers in South Asia or the Pacific region. This has not been for a lack of trying: Eurofighter has entered ultimately failed bids to sell the aircraft to India, Japan, South Korea, and Singapore. In each of these cases, the Typhoon lost out to its competitors (India selected a limited order of Rafales, Japan went for the F-35, and Seoul and Singapore went for varieties of Boeing’s F-15). However, this does not mean that Eurofighter has given up on the Asian market. Several Southeast Asian states are either planning to or are in the process of,updating their combat aircraft. Indonesia and Malaysia are both in the process of replacing their aging F-5s and MiG-29s respectively. Both states have stated an interest in the Typhoon. Interestingly, there are some rumors that Vietnam is also considering buying western military hardware, possibly including the Typhoon. Indonesian Defense Minister Purnomo Yusgiantoro previously stated that his country was “in the process of evaluating which jet fighter will best suit our requirements, whether the aircraft is from Russia, USA or other countries.” This year, Indonesia’s General Moeldoko said that “the ministry is looking at buying 16 aircraft, but the type and number of aircraft depends on Indonesia’s financial position.” Two months ago, Jakarta announced that it will purchase a squadron of 16 Sukhoi-35s (Flanker E), an upgraded version of the Su-27 currently in the Indonesian Air Force’s service. However, Eurofighter and other companies have not given up on selling the Typhoon to Indonesia. This August, a Eurofighter team visited Jakarta, offering technology transfers and the right to assemble some of the aircraft in Indonesia, if Indonesia selects the aircraft. Under Indonesian law, new defense acquisitions must include a minimum 30 percent direct offset, while the selection criteria have been weighted 30 percent for aircraft/system performance, 30 percent acquisition/life-cycle costs, and 40 percent for industrial cooperation. In other words, this could be a solid selling point. Vietnam is a bit of a wild card. There are reports that Hanoi is seeking to acquire western military kit, both in order to beef up its capabilities vis-à-vis China, but also to diversify the source of its military imports. The country primarily fields Russian/Soviet hardware and needs to be able to import material from other sources in case Moscow is unable or unwilling to sell arms to Hanoi. For example, the Vietnam People’s Navy recently acquired four Dutch Sigma-class corvettes. Vietnam also procured Russian 12 Sukhoi Su-30MMks in 2013. However, the bulk of its airworthy kit is still made up of aging MiG-21s, which would be hopelessly outmatched by the PLAAF’s modern platforms. As such, according to Reuters, Vietnam is looking to acquire modern fourth generation aircraft, preferably from a non-Russian source. An anonymous defense contractor reportedly said that several western defense companies, notably Boeing, Saab, and Eurofighter had visited Hanoi to discuss potential arms transfers. However, buying lots of American kit could antagonize Beijing unnecessarily, which probably makes it less likely that it will purchase Boeing’s Super Hornet. That leaves the “Eurocanards,” of which the Typhoon is a solid option. Malaysia is set to replace its ageing MiG-29s and has requested proposals from companies around the world. In addition to the Eurofighter, the Rafale, Gripen C/D and the Super Hornet are being considered. Although the odds are stacked in the Swedes’ favor due to the Gripen’s competitive price, Eurofighter still has some things going for it. For a start, like every one of the Gripen’s competitors, it features a twin-engine design, giving it better range. The Typhoon also sports the Captor-E radar, offering something like three times the coverage of the Rafale’s F3R. This piece of kit is now in production and will be in service in 2018, meaning it would be available from day one if Kuala Lumpur decides to go for Eurofighter’s aircraft. One notable drawback which affects the Typhoon’s chances with all three Southeast Asian states is the fact that it isn’t equipped with air-to-sea capabilities. (As opposed to Dassault’s Rafale, for example.) However, this might change in the near future, as Eurofighter has received several requests for the Typhoon to be fitted with the naval version of Britain’s new “smart missile,” the Brimstone. As with all of the fighters I’ve covered the last couple of weeks, the Eurofighter is a great piece of kit. The only problem is, so are its competitors. Sweden’s Saab recently unveiled a new bid to gain access to Indonesia’s fighter market. Can it beat the Russian favorite?